When does one plus one equal more than two? I have posted on this topic before. One of the hedge fund reinsurer strategies is to combine low volatility P&C business (primarily as a source of cheap “float”)with the alpha seeking asset business. My problem with this strategy is that every reinsurer is looking out for low volatility/stable return (re)insurance business (its the holy grail after all! ), even more so in today’s highly efficient and competitive market. So what can clever chino wearing quants living on a tropical island offer that every other established reinsurer can’t? I suspect that the answer is to price the business with a higher discount rate based upon their higher expected return. S&P point out that this may create increased risks elsewhere such as liquidity risk in stress scenarios. Another strategy is to combine volatile property catastrophe risk with higher asset risk, essentially combining two tail risk strategies. This pushes the business model more towards the highly leveraged model as per that used by the monoline insurer, the ultimate “picking up pennies in front of a stream-roller” play. 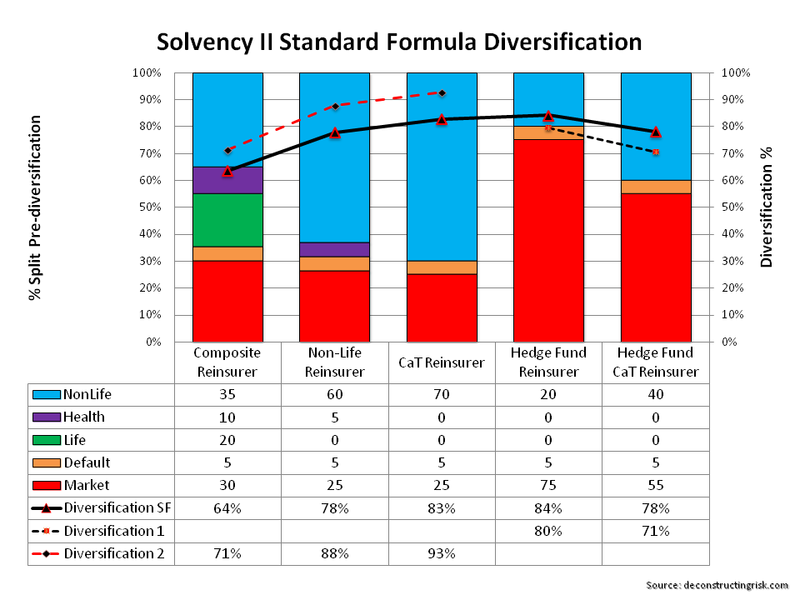 To get an idea of the theory behind the various strategies, the graph below illustrates the diversification of each using the calculation in the Solvency II standard formula, with different concentrations for market, counterparty, life, health and non-life risks (selected for illustration purposes only). The graph shows that a hedge fund reinsurer with a low volatility liability strategy shows the least amount of diversification compared to a composite, non-life or a property cat reinsurer due to the dominance of market risk. Interesting, the high risk strategy of combining a hedge fund strategy on assets with property cat on the liability side shows diversification at a similar level (i.e. 78%) to that of a non-life reinsurer where non-life risk dominates. Hedge fund reinsurers would no doubt argue that, through their alpha creating ability, the 25% correlation between market and non-life risk is too high for them. Reducing that correlation to 0% for the hedge fund reinsurers gives the diversification above, as per “Diversification 1” above. Some may even argue that the 25% correlation in the standard formula is too low for traditional players, as this post on Munich Re’s results excluding catastrophic losses illustrates, so I have shown the diversification for an illustrative composite, non-life or a property cat reinsurer with a 75% correlation between market and non-life risks, as per “Diversification 2” above. In my opinion, one plus one is always two and under-priced risk cannot be justified by combining risk strategies. Risk is risk and combining two risks doesn’t change the fundamentals of each. One strategy that hasn’t re-emerged as yet is what I call the hedging reinsurer whereby liabilities are specifically hedged by asset strategies. Initially, the property cat reinsurers tried to use weather derivatives to hedge their risk but an illiquid market for weather derivatives and the considerable amount of basis risk resulted in difficulties with the strategy. The strategy is commonly used on the life side of the business with investment type business, particularly business with guarantees and options. Also the appetite for longevity risk by those reinsurers with significant mortality exposure that can significantly hedge the longevity risk is a major developing market trend. I do not see why the strategy could not be used more on the non-life side for economic related exposures such as mortgage indemnity or other credit type exposures. In the immediate term, the best strategy that I see is the arbitrage one that those who have survived a few underwriting cycles are following, as per this post. On that point, I noticed that BRIT, in their results today, stated they have “taken advantage of current market conditions in reinsurance to significantly strengthen group wide catastrophe cover. These additional protections include a property aggregate catastrophe cover and some additional variable quota share protection”. When risk is cheap, arbitrating it makes the most sense to me as a strategy, not doubling up on risks. This entry was posted in Insurance Market, Insurance Models and tagged alpha creating, arbitrage reinsurer, capital efficient, catastrophic losses, correlation, counterparty risk, credit type exposures, diversification, diversification benefits, health risk, Hedge Fund Reinsurer, hedge fund strategy, hedging reinsurer, higher investment returns, insurance float, life risk, liquidity risk, longevity risk, low volatility, market risk, mortality exposure, mortgage indemnity, non-life risks, one plus one is always two, P&C business, property cat, reinsurance pricing, reinsurer strategy, risk adjusted returns, risk controls, risk cultures, S&P, Solvency II standard formula, stress scenarios, tail risk strategies, underpriced risk. Bookmark the permalink.